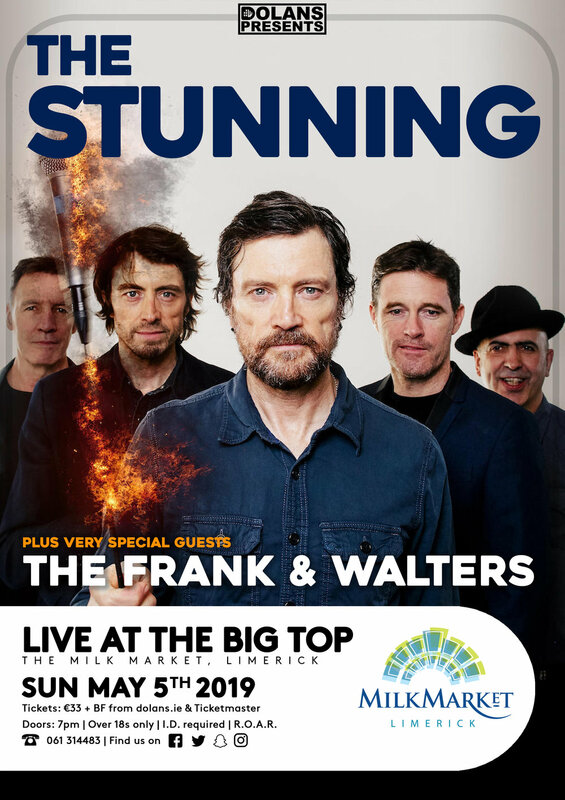 Following on from a triumphant year in 2018, The Stunning return to Limerick to perform in the Big Top at the Milk Market in Limerick City on May 5th 2019 as part of Riverfest. ‘Twice Around The World’, the first album release by the band since 1994, went straight to Number 1 on it’s release in March 2018. Rave reviews and the fact that it contains some of the bands biggest hits (Everything that Rises, Heads Are Gonna Roll, She’s on My Mind & Mr.Ginger) along with Brighten Up My Life (one of the most played Irish songs on radio of 2017) helped it on its way to the top of the charts. The ‘Twice Around the World Tour’ saw the band sell out venues across the country, headlining the Féile Classical, the Galway Arts Festival and also returning Dublin’s Olympia Theatre three times in the space of just over a year. Amidst the mayhem, lead singer Steve Wall squeezed in some time for his acting career, playing the lead role in ‘My Foolish Heart’ a feature film based on the life of legendary trumpet player Chet Baker. The Stunning’s have a well-earned reputation of a band that always deliver an impressive live show.